(University of Stuttgart Institute of Polymer Testing and Polymer Science (IKP) Department of Non-Destructive Testing Pfaffenwaldring 32 D-70569 Stuttgart, Germany. Surface acoustic wave (SAW) research and applications have experienced a wide-scale boom over the last two decades. A number of high-frequency SAW applications were introduced into both analogue and digital signal processing technologies. However, such SAW advances practically avoided the field of acoustic NDT. A major reason for that is concerned with the lack of simple and reliable SAW generation and detection techniques applicable to non-piezoelectric materials. In piezoelectric substrates, the problem is solved by using interdigital transducers: a highly efficient versatile method, which covers entire practically important frequency range from units of MHz up to tens of GHz. In isotropic solids, the "old-timer" wedge technique still remains the most usable one, though its evident drawbacks (compound structure, selection of angles, complicated design, etc.) make the SAW transducers rather awkward (as compared with bulk wave counterparts) and confine the area of SAW applications in NDT. In the present paper the problem of acoustic NDT of cylindrical samples (engine valves) is tackled by using SAW generated with conventional longitudinal wave (LW-) transducers. An efficient and flexible operation in the 5-15 MHz frequency range was demonstrated and enabled to implement SAW B-scans of cylindrical samples. A single LW-probe could also be used for SAW detection; an optical interferometric vibrometry was shown to be a remote alternative of a SAW receiver. SAW scanning in a transmission mode was applied to acoustic NDT of topographic and structural inhomogeneities as well as fractured defects in ceramic and metal engine valves. The mode of operation features a flexible selection of the number of SAW-defect interactions to improve the scattering efficiency. A phase contrast of the B-scans obtained revealed the sensitivity to a valve radius deviation of @ 1 mm. The system developed allowed to discern the damaged areas and surface cracks with sizes down to @ 30 mm. According to (1), to generate SAW one can use a narrow LW-transducer with (L << l ) that is hardly possible at a flat sample surface in the ultrasonic frequency range, since for 10 MHz SAW it leads to L < 100mm. However, for a curved surface (spherical, cylindrical, etc.) such a contact could be realised quite easily by attaching a conventional LW-transducer to a sample surface through a thin liquid couplant layer. In a case of cylindrical samples, it will form a SAW line source with the aperture W equal to the diameter of the LW-transducer. In a pulse mode operation, a single LW-probe can also be used for receiving SAWs after any number of revolutions similar to conventional bulk wave instruments operating in the A-scan reflection mode. By moving the transducer along a cylinder axis, a specific transmission B-scan of an entire surface of a sample is implemented with a single probe. An experimental study of the above scanning mode was carried out with cylindrical samples of engine valves (shaft radii r @ 2.9 ;@ 4 and @ 6 mm) of various materials (hot pressed Silicon Nitride-, alumina-ceramics, steel, etc.) in the frequency range 5-15 MHz. Standard LW-probes (Krautkraemer-Branson) of correspondent frequencies were attached to a highly polished surface of the samples through a thin layer of couplant (or even through a dry coupling). A short spike voltage (repetition rate 47 Hz, amplitude 100-400 V, rise time 10-20 ns) was applied to the probe whose free damped vibrations resulted in electrical (and acoustical) pulses of @1ms (several RF-periods) duration. 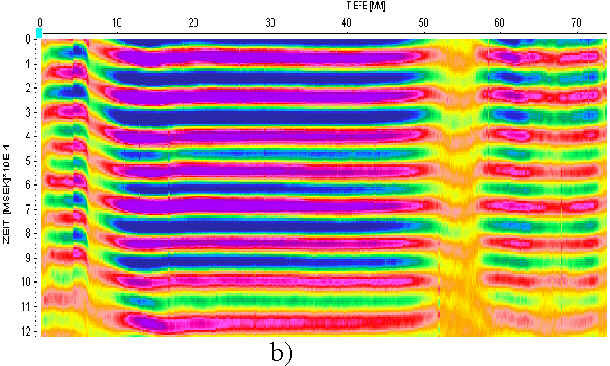 At 5 MHz, an efficient RF SAW generation in the direction normal to a cylinder element was observed for the samples of any diameter. Several dozens of SAW revolutions were registered with a total propagation distance of more that 1 m for @ 6mm valve shaft diameter. Minimal input-output insertion losses were measured to be @ 65dB; all spurious signals could be made @ 30dB below the SAW level. A 15-MHz SAW probe was found to operate properly with samples of small radius of curvature r ; for r³ 6mmthe SAW generated had a form of a single period of low (3-5 MHz) frequency ("video-pulse"). Such a "rectification" effect is, apparently, due to an increase in contact area between a probe and a sample as its surface curvature decreases. As a result, the efficiency of high-frequency SAW generation (greater kL in (1)) drops down, while low-frequency spectral components (corresponding to small kL) are still generated efficiently. This makes SAW generation by the LW-probes be frequency dependent. Output SAW pulses after amplification and A/D converter (sampling frequency 200 MHz) were observed using a digital framestore. By choosing a delay of processing time-gate, any of successive SAW revolutions can be analysed. 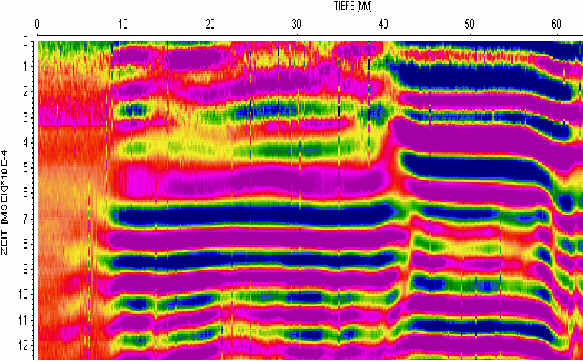 To obtain a SAW-B-scan image of a valve shaft surface, a standard scanning table (ISEL-PRO-DIN) was used. The speed of scanning could be varied within wide limits (5-25 mm/s) with no visible impact on the quality of the image obtained. The b-value increases with a cylinder curvature according to the expression : b = 2(an - ap)/kr. Since ap < 0,b > 0 and both beam steering and diffraction are retarded by the curvature induced anisotropy of a cylinder. This effect must support a collimated SAW beam for longer distances of propagation in the direction normal to an element. In our experiments we studied SAW propagation parameters for ceramic cylinders with r @ 2.9 mm at frequencies 5 and 15 MHz. An analogue of a pulse-echo technique based on measuring delay time versus distance for consecutive SAW revolutions was used to determine SAW velocity in a transmission mode. A large number of SAW revolutions available reduced the error of measurements substantially. The SAW velocity values were measured to be: 1576 ± 5 m/s and 1592 ± 5 m/s for 15 and 5 MHz, correspondingly. According to calculations b (15 MHz) @ 0.08 , while b (5 MHz) @ 0.24 and from (2): n(5 MHz) - n(15 MHz)/n(5 MHz) @0.05. The somewhat lower value D n / n @ 0.01 obtained in experiment is apparently due to the pulse-mode (wide-band spectrum) measurements obviously reducing the frequency difference in the above two cases. For 5 MHz SAW, b @ 0.24 and the effect of curvature induced anisotropy on SAW diffraction is noticeable: X F is to be increased by @ 1.3 times. The low diffraction loss distance XF was determined experimentally by measuring the amplitudes of SAWs after successive revolutions. According to the measurements, for 5 and 15 MHz SAW the values of XF are @ 40 mm and @100 mm , respectively, that is in a good agreement with theoretical estimations from (4) for the above values of b. SAW detection can also be implemented remotely by any of acousto-optical techniques developed for acoustic wave probing. In experiments, we studied a feasibility of a high frequency SAW remote detection using a commercially available optical vibrometer (OFV-302 Single Point Interferometer, Polytec). It utilises heterodyne He-Ne laser interferometry (superimposing an incident laser beam and a beam reflected from a sample) to generate an optical interference signal with modulation frequency proportional to acoustic displacement (or velocity). After conversion to electrical signal it is transmitted to the processor controller (OFV 2700 HF, frequency bandwidth 20 MHz) where signal processing was used to measure SAW displacement. To optimise the intensity of light reflected backward from a cylindrical surface and an opportunity for optical and acoustical scanning , a thorough alignment of an incident optical beam in respect to a valve axis was needed. An optical alignment system developed for this purpose includes fine motions of the optical head combined with 2D-fine adjustments of acoustical probe and the valve axis. The adjustment system enabled the laser beam to move precisely along the valve axis while the samples were mounted on a special holder and scanned vertically in respect to the laser beam. The acoustic probe was positioned in a horizontal plane containing the laser beam (at angles 900 and 1800 in respect to it) to provide the SAW pulse propagation in the direction normal to the valve axis and the laser beam. A 2D- motion of the transducer in a horizontal plane allowed to monitor the contact pressure on the valve surface and to adjust a SAW beam aperture. Due to a finite size of a laser spot (d) on the sample surface, the optical detection of SAW is frequency dependent. Similarly to (1), its efficiency depends on (kd) and decreases for high frequency SAW (l £ d; kd > 1). To prevent the "cut-off" of high-frequency SAW components a thorough laser beam focusing is needed (d < 100 mm for 15-MHz SAW). After adjusting the vibrometer optical system as well as the distance between the sample and laser head, a reliable performance was achieved over the entire frequency range 5-15 MHz. In 1800-position the laser beam probes the surface area where two oppositely propagating SAW pulses overlap, resulting in a single output signal for any point along a sample axis (a "standing mode" acousto-optical B-scan, Fig. 1). A " propagation mode" could be realised in the 900-scheme where an asymmetry of the laser beam position allows to separate the SAW pulses propagating clockwise and anti-clockwise along the sample surface (Fig. 2). where P is the SAW total acoustic power and Duz(y,z) is the distance between the crack faces. where the crack elasticity E * depends on the material elastic moduli and the crack depth (a). where K* is the combination of all elastic material parameters from (6) and (7). Important implications of (8) are that the SAW scattering efficiency is proportional to the square of carrier frequency, the volume of the crack and that it increases for narrow SAW beams. A numerical value of K* can be estimated from calculations by : RWk » 3.10-2 at ka » 0.6. For 15 MHz SAW in Silicon Nitride-ceramic: ka » 0.6 corresponds to a @ 35 mm. The expected value of R is, therefore, R @ 1.8.10-3/W(mm). Assuming the relative change in the forward scattered SAW amplitude (amplitude contrast): DuT/uI @ nR , where n is the number of SAW revolutions, one obtains: DuT/uI @ 1% for W @ 1 mm and n = 5. The SAW phase contrast is caused by its additional delay due to propagation along the crack faces: D t = 2a/n. For the crack depth a = 30 m m ,D t @ 10 ns . At 15 MHz this corresponds to a phase delay D f @ p/3. A 100 mm -crack causes D f @ p. For 30 MHz SAW one obtains Df @ 2 p/3 (a @ 30 m m ) and D f @ 2 p for a @ 100 m m. These estimations correspond to one SAW revolution only; it is obvious that the phase contrast will also increase with the distance of propagation (or n ). The crack is in near fields of both the receiver and transmitter for any n chosen (XF ³ nl, large W/l). The crack is in the near field for n = 1, while it is in a far-field for n > 1(moderate W/l, XF @ l < nl ). The crack is in a far-field even for n = 1 (small W/l, XF<l). Near-far field . Since XF << XR, the last factor <<1 and RNF << RNN. Thus, to enhance the SAW scattering efficiency by a crack, firstly, one should make the number of revolutions n correspond to near-near field case. Secondly, according to (6) the aperture of the transducer also should be reduced. For a 15 MHz SAW transducer of maximum aperture: W@ 6.2 mm : XF @ 100 mm that corresponds to a total maximum number of revolutions within a near-near zone n @ 5( l @ 19 mm for a standard valve). Reduction in W results in a decrease of XF , therefore one should reduce the number of n to stay in a near-near field. However, the reduction in n reduces the amplitude contrast DuT/uI, so the optimal scanning performance for SAW used in experiment is expected for n = 2- 4 and the aperture reduced to W@ 3 - 5 mm. 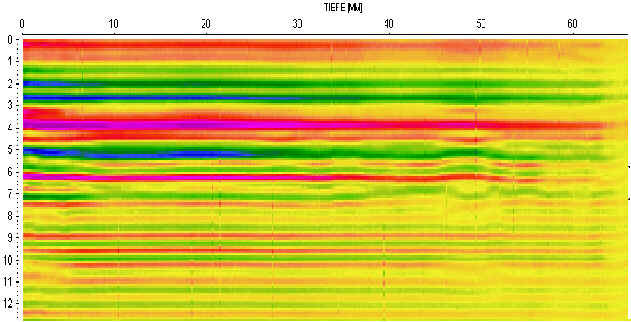 5 MHz SAW scans of ceramic valve surface with a group of slots oriented normal to a cylinder element (4 slots of width @ 500 m m, depth from @ 100 to 1000 m m) received for different n are shown in Figs. 3a, b. For the SAW transducer of the aperture W @ 5 mm individual slots separated by @ 1.5 mm can not be distinguished within the group, however the gradual increase in slot depths is reflected in the asymmetry of the amplitude contrast of the defect area along the shaft length (Fig. 3b). Experimental results confirm that the optimal distance for the highest amplitude contrast corresponds to n = 2 - 4 ( X T @ XR @ X F @ 40 mm for 5 MHz SAW; total SAW path length @(1 - 2)X F @ 40 - 80 mm ). For larger n the amplitude contrast decreases while the phase contrast dominates: Df @ p/2 for n = 6 (Fig. 3b). The phase change in this case is due to the SAW slowness in a waveguide formed by a slot. The acousto-optical B-scan of the slot shown in Fig. 4 also confirms a high amplitude contrast of the image of the flaw and clearly demonstrates its asymmetry. From Figs. 3b one can also see a very high SAW sensitivity to surface topographic deviations: a phase shift at the left-hand side of the valve corresponds to a "step" of cylindrical profile (decrease of the radius) @ 6 mm measured by a laser scanning microscope. The phase contrast of acoustic image of the "step" increases with SAW propagation distance and reaches D f @ p for n = 6 (Fig. 3b). It shows that cylindrical surface profile discrepancies as small as @ 1 mm could be measured with 5 MHz SAW. Fig 3: SAW B-scan of a saw-cut defect (positioned at X @ 55mm ) in a ceramic valve for different number of SAW revolutions: n=4 (a) and n=6 (b). A set of 3 metallic (almost) spherical inclusions (with diameters @ 500, @ 1000 and @ 1500 m m separated by @ 10 mm) was incorporated into a surface layer of a ceramic valve shaft. Fig. 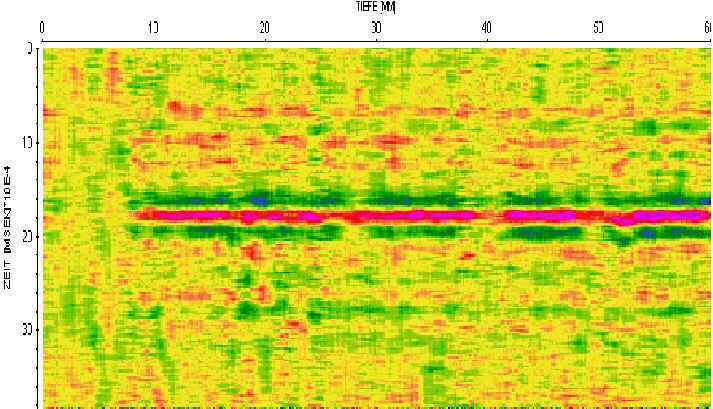 5 shows SAW B-scan picture obtained with 5 MHz SAW for n = 3 . One can see that the defects are clearly resolved with a high amplitude and phase contrast. The latter is greater than for the case of slot flaws, apparently, due to additional phase lag inside the "slow" inclusion material. 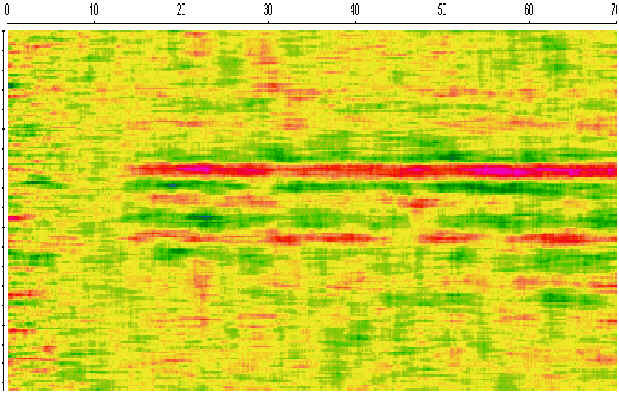 The amplitude contrast for each of the flaws can be estimated from the picture of acousto-optical B-scan (Fig. 6): D u T / u I was found to be @15, 40 and 60% for the above flaws, respectively. Almost linear dependence on the flaw size (rather than » a 3 predicted by (6)) is due to the fact that for 5 MHz the SAW wavelength (l @ 110 mm ) is comparable to the flaw size, so that the long-wavelength scattering approximation is not valid any more. Figs. 7 and 8 show 5 MHz SAW B scans for ceramic and steel valves without localised defects but with structural inhomogeneity areas. Fig. 7 reveals a dramatic increase in SAW background attenuation in the valve material. Since this is, apparently, concerned with an increase of material grain size, it clearly indicates deviations in ceramic material manufacturing conditions. The high SAW attenuation is naturally accompanied by a strong phase change that also confirms an inhomogeneous structure and even reveals positions of some inhomogeneity areas in the ceramic sample (Fig. 7). A phase contrast makes a major contribution to the B-scan image of the used steel engine valve (Fig. 8). We assume that it is concerned with temperature gradients in the course of the valve operation, which leads to material structural modification (hardening). It causes mostly elasticity related changes rather than having an impact on the grain size. The SAW phase change caused by variation in material elastic properties with no substantial effect on dissipation was also observed in alumina-ceramic cylinders (Fig. 9). A smooth SAW phase lag along the cylinder axis seen in the picture demonstrates a gradual decrease in wave velocity. According to the data in Fig. 9 an additional delay Dt @ 100 ns measured over the cylinder length corresponds to a relative SAW velocity decrease @ 1%. Such a gradient in elastic properties is possibly due to compression gradients in the manufacturing process of hot-pressed ceramic cylinders and, therefore, can be used to monitor the quality of the ceramic materials and products. A set of four @ 50-100N Vickers indentations accompanied by visible surface cracks (lengths @ 100 - 150 mm ). A set of three @ 10N Vickers indentations (size of @ 30m m ) with no visible cracks around them. 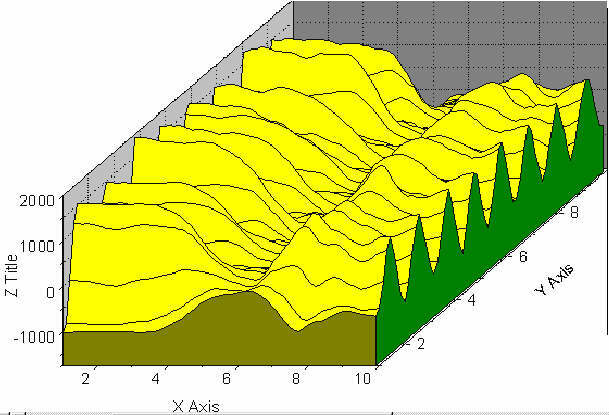 Fig 10: SAW B-scan of a set of four 100N Vickers indentations at X @ 47mm,@ 35mm,@ 28mm and @ 19mm. 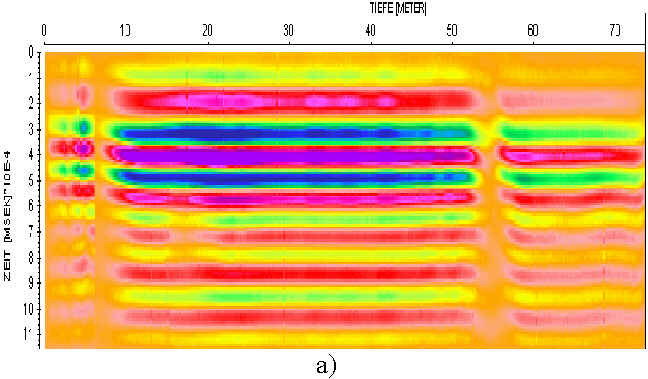 Fig 11: SAW B-scan of a group of three 10N Vickers indentations in a Silicon Nitride -valve after A-trace deconvolution:defects positioned at X @ 12mm, @ 15mm and X @ 30mm. The images of B-scans for the first set of cracked defects are shown in Fig. 10. One can see the SAW amplitude and phase distortion areas at the positions of the defects (@ 47 mm, @ 35 mm , @ 28 mm and @ 19 mm). 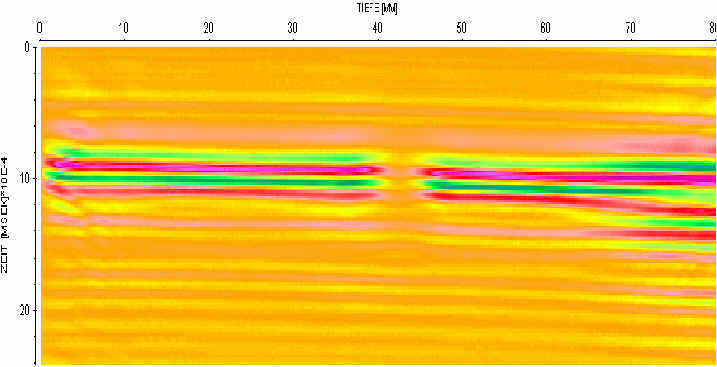 From these data, the SAW phase contrast is seen to be more sensitive to the presence of the cracks: for the 15 MHz SAW and n = 3 one finds Df @ p/2 for the crack of length @150 mm (Fig. 10). The image contrast was found to be lower for the second set of smaller indentations. To enhance it some digital image processing (FFT, deconvolution, etc.) had to be used. Fig. 11 shows the results of deconvolution operation which was applied to consecutive A-traces of the B-scan. One can see discernible amplitude contrast of the processed image at X@ 30 mm (a position of a single @ 30 m m indentation) and clearly visible location of a pair of closely positioned indentations at X @ 12 mm and @ 15 mm. The paper presents an approach to NDT of surface flaws in cylindrical ceramic samples (shafts of engine valves) based on SAW scattering by various defects (inclusions, material inhomogeneity areas, cracks, etc.) . Conventional L-wave transducers are demonstrated to be applicable for SAW generation and detection in cylindrical samples of isotropic materials over the frequency range 5-15 MHz. The results obtained show that for the samples of small radius (r£3 mm) this simple technique can be used at frequencies as high as @30 MHz. Experiments confirm that SAW propagating along a cylindrical surface is affected by curvature induced dispersion and anisotropic diffraction. An optical probing using commercially available vibrometers (Polytec) is a viable technique for remote detection (and acousto-optical scanning) of high-frequency SAW even at curved surfaces. A unique single-probe SAW transmission B-scan can be used to inspect an entire cylindrical part of an engine valve. The experiments prove that the technique works equally well with various surface and sub-surface defects: inclusions, inhomogeneities and cracks. The minimum crack depth discernible with 15 MHz SAW is measured to be @30 mm. Besides, a very high SAW phase sensitivity to topographic discrepancies of cylindrical surface profile (@1mm) is shown for 5 MHz SAW. 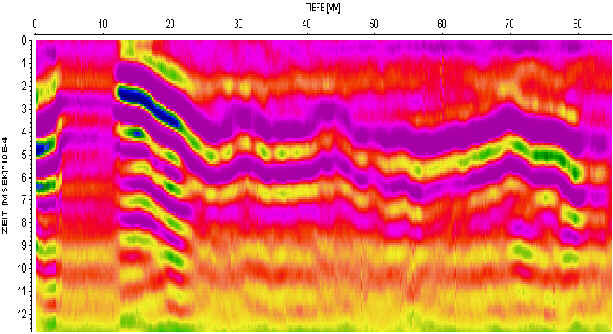 Overall performance of the SAW B-scanning developed proves it to be a simple, reliable and sensitive NDT technique applicable to a variety of cylindrical samples and products. The areas of its feasible applications include not only non-destructive evaluation of defects but also material property characterisation, assessment of integrity and surface profile control of a wide-range of cylindrical shape parts and products used in machine and aviation industry. The authors are grateful to the Deutsche Forschungsgemeinschaft (DFG) for funding of this work (TFB 04). I.A.Victorov, "Rayleigh and Lamb Waves", New York: Plenum Press, 1967. S.V.Biryukov, Yu.V.Gulyaev, V.V.Krylov, and V.P.Plessky, "urface Acoustic Waves in Inhomogeneous Media", Berlin Heidelberg: Springer-Verlag, 1995, p. 205. A.J.Slobodnik, Jr., "Materials and Their Influence on Performance", in: "Acoustic Surface Waves", ed. A.A.Oliner, Berlin Heidelberg: Springer-Verlag, 1978, p. 251. B.A.Auld, "General Electromechanical Reciprocity Relations Applied to the Calculation of Elastic Wave Scattering Coefficients", Wave Motion, 1979, v. 1, N 1, pp. 3-10. G.Kino, "The Application of Reciprocity Theory to Scattering of Acoustic Waves by Flaws", J. Appl. Phys., 1978, v. 49, N 6, pp. 3190-3199. J.J.Tien, B.T.Khuri-Yakub, G.Kino, A.G.Evans, and D.Marshall, "Long Wavelength Measurements of Surface Cracks in Silicon Nitride", in: Review of Progress in Quantitative Nondestructive Evaluation, eds. D.O.Thompson and D.E.Chimenti, 1982, v. 1, pp. 569-571.